Michael and Michael talk a little about doing the work of writing... the outlining, the rewriting, the rediscovery of the emotional impact of what you're writing, and more. 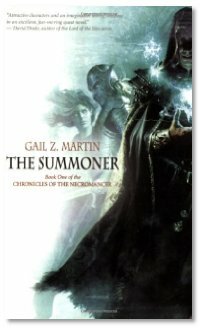 Interview: Michael and Michael talk with Gail Z. Martin about The Summoner, the first book in her new series "The Chronicles of The Necromancer". It's all about an orphaned prince who must learn how to master a rare magical ability, avenge his murdered family, and reclaim the kingdom that had been stolen from him. Interview: Michael and Michael next talk with Phil Rossi about his podiobook "Crescent", currently one of the fasting growing podcast novels out there. It's based on a space station, and is a little bit ghost story, a little bit romantic action-adventure, and a little bit mystery all rolled into the same story. Phil seems to have made a creative shift from music to fiction, but he hasn't drifted too far away from his musical roots. Head over to his website and uncover more. The Library: Michael, Michael and Brian go through the newest arrivals to the studio: The Devil's Right Hand by Lilith Saint Crow; Sandworms of Dune audiobook by Kevin J. Anderson and Brian Herbert, The Accidental Time Machine by Joe Haldeman; Conquerer by Stephen Baxter; The Mirador by Sarah Monette; The Mirror of Worlds by David Drake; Red Seas Under Red Skies by Scott Lynch; In At the Death by Harry Turtledove; Shadowpuppets audiobook by Orson Scott Card. i'll have to check out gail's book and of course i'm listening to mr phil rossi. cresent is AWsoMe!!! he talks hard!!! of course if it were not for C2C i'm not sure i'd be into so many podcast books as i listen too. thank you for introducing me to them (i started way back with the 3 that debued on your podcast)....and yeah i just love the dynamic sigler, hutchins and rossi have created. i support them just as i support your broadcast. p.s. can you guess where my name is taken from? Dragon Page crew. Thanks for having me on the show. I've long been a fan and I had a blast. I look forward to doing it again sometime! Poda--thanks for the continued support! Uhh..."Sandworms of Dune" is not a prequel novel, gentlemen. It's the "grand conclusion" of the entire Dune sequence, picking up where "Hunters of Dune" left off as the follow-up to Frank Herbert's final novel "Chapterhouse: Dune". Woohoo! The new Scott Lynch is out? Lies of Locke Lamora was excellent so I'm very excited about Red Seas.